Moves are afoot to re-route heavy traffic currently damaging road surfaces and putting the safety of pedestrians in Hawick at risk. Scottish Borders Timber Transport Group members councillors Ron Smith and George Turnbull are pressing for improvements to be made to the Hawthornside junction on the A6088. They want to see the preferred route for lorries carrying timber from the forests around Langburnshiels being better used. 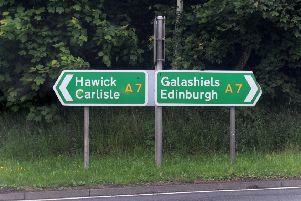 The agreed route is for hauliers to use the road across from Berryfell to Hawthornside, thus avoiding travelling through Hawick. However, the junction at Hawthornside is difficult to negotiate, prompting many truckers to plump for the easier option. Mr Turnbull and Mr Smith, along with fellow Hawick and Hermitage ward councillor Davie Paterson, recently visited the junction to assess the difficulties posed. Mr Turnbull said: “We found a steep approach to the corner from the Earlside and Berryfell direction, with the angle of the junction more naturally pointing down towards Bonchester Bridge. “I can fully understand why drivers have been reluctant to use this route to go northwards”. For some months, the two councillors have been urging the timber transport group and Scottish Borders Council Roads officers to invest in changing the layout of the corner, and they have now been given a progress report by officials. It is estimated that this work could be completed by mid-February, and James England, timber transport officer for the south of Scotland, says he will support the bid. Mr Paterson said: “For years, there have been complaints about timber wagons coming up past Stobs and Crowbyres before edging through the Backdamgate. “Damage has been caused to the road and to river banks, and Backdamgate simply isn’t suitable for such heavy transport. Mr Smith said: “This has become a mission for George and myself. We realise this would put added pressure on the smaller C29 road, but we would want, as part of the project, to see additional passing places installed. The three councillors have also welcomed the improvements currently taking place along the Borthwick Valley road from Deanburnhaugh to Girnwood. The road was severely damaged by timber wagons carrying felled timber from Lorna’s Wood forest, but a bid for funding from the Scottish Timber Transport Fund to repair it was turned down. Scottish Borders Council workers are now rebuilding the road.